A museum curator on trial for displaying “obscene” photographs defends his free speech rights in a fierce legal battle. Based on a true story. 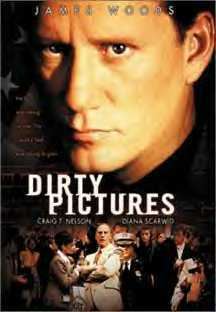 Dirty Pictures credits: [Dir: Frank Pierson/ James Woods, Craig T. Nelson, Diana Scarwid/ 95min/ Drama/ Freedom of Speech, Government Enforced Morality] Click here to see trailer. For the most part, the work of late photographer Robert Mapplethorpe is uncontroversial. But it also includes a few pictures — some sadomasochistic others blasphemous — seemingly calculated to offend. So, when Dennis Barrie, curator of the Cincinnati Arts Center, exhibited Mapplethorpe’s show The Perfect Moment, he knew that such photographs would be criticized. But Barrie did not expect what happened next–he was promptly charged with “pandering obscenity.” His trial is the focus of this film. Barrie is portrayed as a modest, ordinary man, suddenly thrown into extraordinary circumstances, an accidental hero who rises to the occasion to defend his First Amendment rights despite enormous pressure to give in. And indeed the real Dennis Barrie did face possible jail time and personal intimidation. The other heroes of this story are the jury, who, despite biased decisions on the part of the judge and personal pressures of their own, managed to navigate their way to the right decision. Dirty Pictures ends with a speech, the upshot of which is that if freedom of expression is not to be lost an inch at a time, its defenders must not concede it an inch at a time but defend it at every instance. It’s an inspiring statement, but it’s not the last word. In an ominous epilogue, the lead proponent for banning the Mapplethorpe pictures expresses confidence that, despite his loss in the courts, the trial itself will intimidate others into self-censorship. It’s clear that the battle for free expression will call for more like Dennis Barrie. The tree of liberty must be constantly replenished, if not with the blood of patriots, then at least with their determination and fortitude.